Text description provided by the architects. Vietnam is a developing country. Metropolitans are built massively, accompany with the evolution of Internet technology. There are many consequences resulting from smoke, traffic jam, noise, pollution, and the lives are too busy and full of stresses. Vinh City is not an exception. 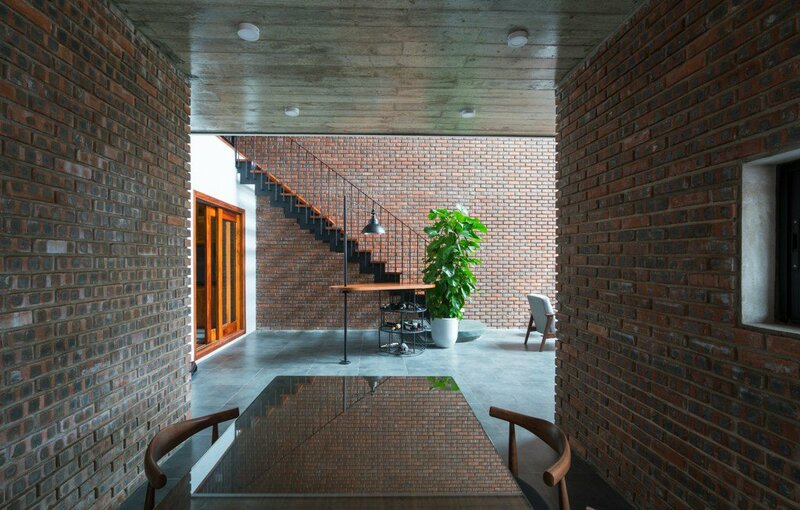 V3 house is a silent corner in the noisy Vinh city. It is a peaceful space that helps us imagine and think of our memory. And then we could seek the human balance. V3 house structure has a large space throughout the main structure. That helps us imagine a traditional yard with the roof, it could also give us a picture of caves which are covered around by trees. The light passes through the leaves of trees and fades on the brick walls. This space which is unreasonable and disproportionate with humans asks people to talk with themselves. It’s a new space with a modern and old language. It’s like a shelter where we awake the people memory with the belief that we can find the balance in thinking about memory.